Alert readers will have noticed that my blog-posting schedule slipped last Sunday — I had promised to discuss the Power of Collaboration, but it turned out that one of my current collaborators was visiting from out of town. So instead of writing about collaboration, I actively engaged in some fun and collaborative work! 1. Monorail iPhone puzzle app — a collaboration with my son Aaron during 2011. 2. Android version of my Target Tiling (Tetris-inspired) puzzle app — working with one of my brother’s former students. 3. Working on a new iPhone puzzle app — as part of a team assembled by an MIT classmate of my son’s. 4. Researching techniques for solving very large search problems — collaborating with my brother, Wayne, who is a CS professor at Westmont College. The last 3 of these are actively ongoing, and I plan to write more about them in future posts. It seems fairly obvious and natural (as a general rule) that 2 or more people working together can accomplish more than any one person working alone. They can share the work and thus accomplish more. But my experience is that the productivity of collaboration is not additive, but is in fact multiplicative. When I’m working with a collaborator, I estimate that I am at minimum 10 times more productive and sometimes even more than that! My intent in this note is to examine how this works, and why it is the case. I will be focusing on 2-person collaborations since that is what I have the most experience with. If there is a fixed amount of work to do for a project, then 2 collaborators might be expected to accomplish it in half the time. This assumes that both collaborators are equally capable of doing all of the work themselves with comparable efficiency. If the collaborators are specialized so that each works best on separate sub-tasks, then dividing the work according to these specialties yields a greater than 2-fold increase in productivity. In the most extreme case, imagine that neither collaborator has all the skills needed to do the project / task. Then the time for either one working alone would be infinite! But working together, if their skills together cover what’s needed, they can accomplish the task collaboratively in finite time. That’s quite a speedup! The knowledge and skills of even a 2-person team can be much greater than that of either individual alone. Beyond dividing tasks according to respective expertise and specialization, the collaborators can share their knowledge and skills with each other so that each becomes individually more productive as well! This seems very similar to the power of community learning environments (such as ESG at MIT), where the shared knowledge within the community enhances the knowledge of each individual community member. There is also synergy of ideas — collaborative brainstorming can be both fun and productive, with each collaborator contributing ideas, and feeding off of (reacting to) the ideas of the other. When it comes to evaluating ideas, having 2 points of view can be beneficial as well. I have a very great tendency to get distracted (I’m probably ADD or something along those lines). When I’m actively collaborating (in realtime) with someone, I find that I’m much more able to maintain focus and “stay on track”. Even when not in realtime, it is still helpful to have a commitment to one’s collaborator — putting off or avoiding things is letting your partner down. Getting unstuck more quickly (avoiding staying stuck for prolonged periods). A very specific and powerful aspect of collaboration is reducing the length of stuck times! When working on a task alone, I often run up against obstacles which stump me (sometimes for prolonged periods). This can occur for many reasons, including lack of a specific skill or piece of knowledge, or simply not being able to immediately solve some challenge. Very often, one’s collaborator can offer a key insight or suggest a useful tool or mechanism that gets me quickly unstuck. Without that outside help, I am much more likely to stay stuck for an extended period. Similarly, my collaborators can often “rescue” me from pursuing a dead end, by helping me recognize earlier on that it’s either hopeless or unproductive. But overall I find that the powerful benefits of collaboration far outweigh any disadvantages! Collaboration “case studies” — exploring more concretely some of my experiences in working with collaborators. Today I’ll wrap up the current discussion of Target Tiling with a look at how to achieve symmetry. Also, I’ll describe something I call pseudo-symmetry, which is similar to and behaves somewhat like symmetry. 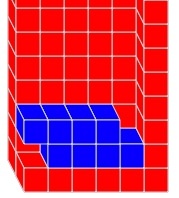 For Target Tiling on a board of width = 5, there are a total of 32 different row patterns (5-cell patterns of filled and empty cells). 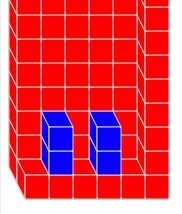 Of these, there are 8 that are left-right mirror symmetric (they are the same when order of cells is reversed). Last week I illustrated the 6 “non-trivial” symmetric patterns (omitting both the empty pattern and the completely filled pattern). That leaves 24 row patterns that are non-symmetric. 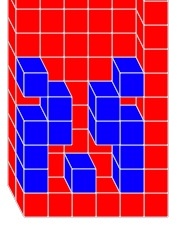 These non-symmetric patterns match up into groups of 4 related patterns: each group containing the 2 mirror reflections of one non-symmetric pattern, each occurring twice — once with the center cell filled and once with the center cell empty. So fundamentally there are 6 different asymmetric patterns (each generating a related group of 4 out of the 24 patterns). Each of these asymmetric patterns (and the variants with reflection and center filled) can be first transformed into a symmetric pattern, and then cleared by a symmetric wipeout using the symmetric macro-operators described in my blog post last week. This symmetric pattern can be wiped out with the application of symmetric macro-operators as discussed last week. 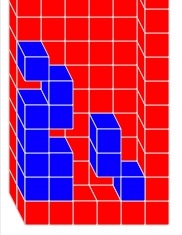 This takes a total of 14 moves. Here is a second example, of clearing a non-symmetric pattern by first transforming it into a pseudo-symmetric pattern (symmetric if rows were superimposed on one another). The only feature that breaks symmetry here is that the single filled cells in the left and right columns are in different rows. 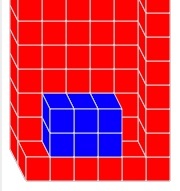 Ignoring this difference, the position is symmetric. 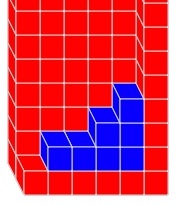 It turns out that this can be transformed into an actually symmetric position with 2 moves. 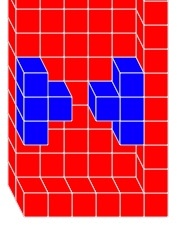 The first move is to place a T at far right with stem in so as to fill the hole at the right of the 2nd row. 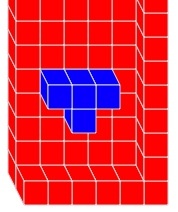 This symmetric position can be wiped out with just 1 more piece filling the T-shaped hole. There are many more patterns to learn, but with practice, one builds up skills for clearing all the non-symmetric patterns. My experience is that symmetric patterns are significantly easier to clear, so it is worthwhile to learn how to achieve symmetry from non-symmetric patterns. Check out Target Tiling — it’s free, it’s fun, and it’s fantastically challenging! 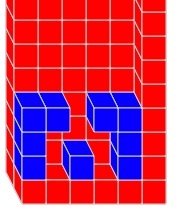 By symmetric positions, I mean board patterns that have left-right (reflective) symmetry, that is, they are unchanged if the order of the columns is reversed. In a symmetric board position, every individual row will itself be symmetric. But of course not all patterns will be symmetric, so for those non-symmetric patterns, the challenge is to achieve symmetry. Why is symmetry useful in the first place? 1. There are far fewer symmetric patterns than non-symmetric ones. 2. 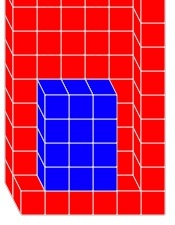 It is easier to recognize familiar symmetric patterns. 3. 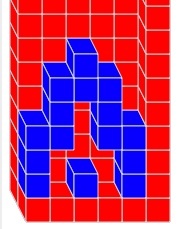 In solving symmetric positions, it is possible to do so while maintaining symmetry! 4. 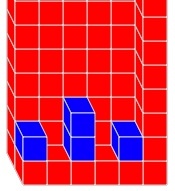 The number of “operators” that maintain symmetry is much smaller than the set of all available operators, so there are fewer choices of what to do at each point (in search terms, the branching factor is smaller). Taking advantage of symmetry has two parts: achieving symmetry, and then maintaining symmetry while simplifying and solving. I will discuss each of these after presenting some examples. 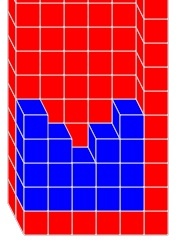 In fact, every possible symmetric row pattern appears in this diagram. There are 6 such symmetric row patterns. Notice that rows 3 and 5 (counting from the bottom) are the cases I discussed last week: Center-hole, and 3-in-the-middle, respectively. I explained how each of these patterns could be cleared by an appropriate macro-operator: the Clear-3 macro for the 3-in-the-middle pattern, and the Clear-Center-Hole macro for the Center-hole pattern. It is possible to learn a “clearing macro” for each of the other 4 row patterns, as well. 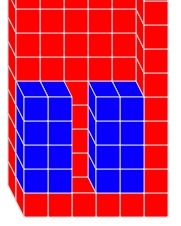 This can only be done in 2 ways, since there are exactly 2 rotations of the T-piece that are left-right symmetric, and the piece must be placed exactly in the center (straddling the center the column). where “+” means “followed by”. Note that any macro-operator composed from symmetric operators will itself be symmetric! The final two rows, each being examples of “3-in-the-middle”, can be cleared by two successive applications of Clear-3. That solves the puzzle!! 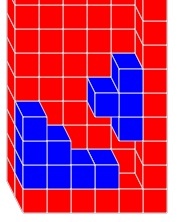 Notice how the positions remained symmetrical at each stage of the solution. Typically rows were cleared one by one. Each of these techniques helps simplify the solving of wipeout challenges. WipeOut coming with next move! Note that the difference between the start and the final positions is the removal of the 3 filled cells in the middle, hence the name Clear-3. The fundamental power of macros is that they allow planning at a more abstract level (hiding or ignoring low-level steps in the planning / problem-solving process)! This can be eliminated (WipedOut) with a single application of Clear-3. Note that the sequence involves 4 Piece placements, but conceptually is just 2 steps (fill hole + Clear-3). This 4-move sequence is a new macro, allowing us to clear any row filled except for a hole in the center. Let’s call this macro Clear-Center-Hole. This starting position can be solved by 4 applications of Clear-Center-Hole. 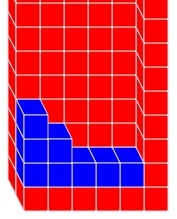 These macros, by themselves, do not suffice to solve (WipeOut) all positions – there are many other patterns, most of which are not even symmetric. 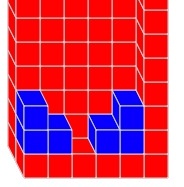 Skill and mastery involves learning patterns for transforming given positions into other simpler / known positions (such as the 3-in-middle and center-hole above). One technique I’ve found quite useful is to transform positions so as to make them symmetric. Once symmetry is achieved, moves can be chosen so as to maintain symmetry, which greatly reduces the number of patterns one is faced with. 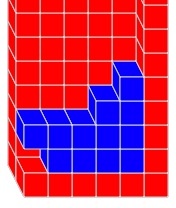 Continuing from last week: more on my Target Tiling puzzle game (inspired by Tetris), including a novel extension to the Tetris row-clearing rule, a seemingly impossible challenge, and a very surprising solution! After each piece placement, any rows that are completely filled are eliminated, and the rows above move down to fill the vacant space. When N (or more) consecutive rows are completely filled, they are cleared as with the original row-clear rule, with any higher rows moving down to fill the emptied space. 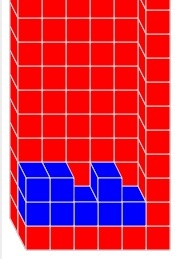 NOTE that when N=1, this rule is exactly the original Tetris rule for row clearing. It turns out that the variants of row-clearing with N= 2, 3, and 4 are interesting and present some quite complex challenges. I started playing with N=2 (Double variant), and learned new patterns for solving the various width, piece, and target patterns. When I felt proficient with that, I advanced to N=3 (Triple), and finally N=4(Quadruple). 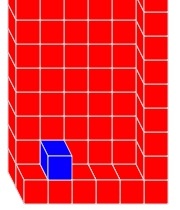 When I tried the N=4 (Quad) variant of Width=5 using T-pieces, I thought I may have reached the limit of solvability. I was stumped for quite a long time, and was close to giving up, declaring it “too hard, and maybe impossible”. Then, one day, I tried something desperate – a totally counter-intuitive Tetris piece placement, and low and behold, this enabled me (with long macro-sequences) to actually solve it! This stumped me for a long time! Everything I tried seemed to lead nowhere. I was about to give up, when I discovered this extremely counter-intuitive T-piece placement. 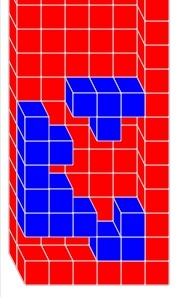 This discovery led eventually to a solution to this and other Width=5 T-piece Quad puzzles! Try not to create any covered holes! This piece-placement violates that heuristic by creating 2 covered holes! On first examination, it looks like it fails to get closer to filling any rows. The surprise was that the top row is filled except for the hole in the 2nd position, and this top row can be eliminated (by first achieving symmetry and then wiping out everything above and including this row (without modifying anything in the pattern below). The Top row (created by the “surprise move”) is now cleared. This is finally looking like progress! Down to 1 Row – after 4 more moves! After 4 more moves – just 1 more move needed to solve! Placing the last T-piece in the hole will clear the final 4 rows, leading to an WipeOut (empty board)! 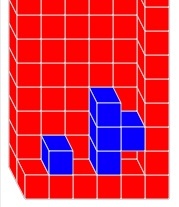 This solution took a total of 23 piece placements starting from the original Stuck Position. I was incredibly excited by this discovery. This “key (surprise) move” insight, and the patterns learned to clear from it, enabled me to solve the entire class of T-piece Width=5 Quad puzzle patterns. What I mean by solving the entire class is being able to solve (WipeOut) any initial pattern given enough clear board space to work with at the top of the board. I could also solve the related class of Target problems. What seemed impossible at first, was actually quite solvable, but required a very specific (surprising and non-intuitive) insight! If you know anything about me, you know that I’m passionate about puzzles. I particularly like logic puzzles, by which I mean puzzles that require logical thinking to solve. In these notes I will try to “think deeply” about puzzles: What is a puzzle? What makes a good puzzle? How do I create new puzzles? There are many different types of puzzles, but the primary common feature is that they have a solution! 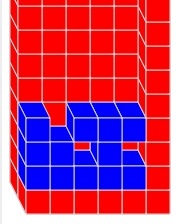 Some puzzles explicitly define the elements of the puzzle and the valid operations or moves. Other puzzles don’t even make clear exactly what the goal is, and part of the puzzle is to “figure out just what the puzzle is”. 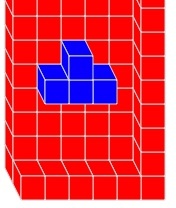 Still other puzzles have hidden elements that may get revealed (e.g. MasterMind, or puzzle boxes with hidden mechanisms). Math problems and scientific research projects can also be viewed as kinds of puzzles, some explicit, others very open-ended. There are jigsaw puzzles where one has to use piece shapes and visual clues to assemble a target picture. 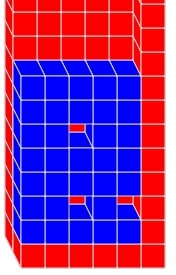 There are popular paper-and-pencil puzzles (like KenKen and Sudoku). 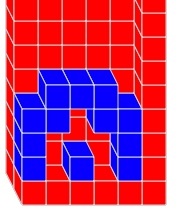 With the development of computers and videogame systems, there are now a wide range of interactive puzzles (and video games). I personally am particularly interested in puzzles which are explicitly stated (goal is clearly defined, and the elements and operators are well-defined), and can be solved by logical thinking. I don’t particularly care for puzzles with hidden goals or hidden elements. Nevertheless, the class of explicit puzzles is quite broad . 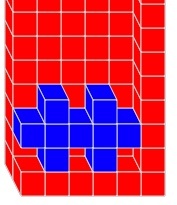 I enjoy physical puzzles, paper-and-pencil puzzles, and interactive (computer and smartphone) puzzles, among others. 3. Computer and videogame puzzles: Tetris, Target Tiling (my Tetris-inspired puzzle game), many of the Soleau Software puzzles, plus my Grand Tour (Monorail/RoundTrip), and One-Way Trip applets. 4. SmartPhone puzzles: here is a link to My Favorite Interactive Logic Puzzles. I especially love Vubu, Relix, BoxedIn, Blockhouse, and Monorail, but all the puzzles listed are great (imho)! What Do I like about these puzzles? c. I can develop skills and expertise at solving (a variety of reasoning strategies that can be learned!). Best of all if there is a hierarchy of skills! 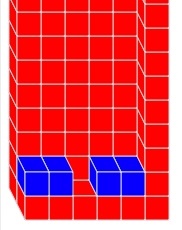 Once I had written a general-purpose Tetris simulator, I began varying and playing with the elements. I tried different board sizes, both narrower (4, 5, 6, 7) and wider up to 20 or 30. 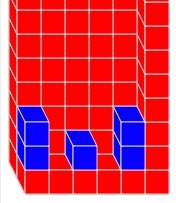 I introduced different piece shapes, again, both smaller (1, 2, and 3-cell pieces), and larger (the full set of Pentomino shapes, which cover 5-cells each). I also varied the speed at which pieces would fall on their own, but I found I much preferred slower speeds (I also included a “Pause” feature”) – in general I’m not a big fan of timed puzzle solving or games – I prefer to think in a more relaxed mode. Tetris is fundamentally a game of survival — typically the pieces speed up until they fall so fast that you can’t control them, at which point the board “fills up” and you lose. I much prefer puzzles and games that I can “win” (solve). At some point I latched onto the challenge of “completely clearing the board”. I thought this made a nice clear objective, and provided satisfying closure when achieved! I first tried this (as a self-defined objective) in Tetris on the NES, but it was extremely difficult to achieve because the “Next Piece” was always chosen randomly – so one couldn’t plan ahead very far. 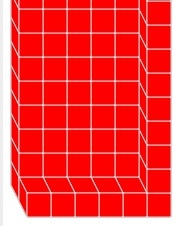 I’d try to achieve a board pattern with the “bottom rows” filled except for a “hole” in the shape of one of the pieces. Even doing that is quite difficult, but once accomplished one has only a 1-in-7 chance of getting the necessary shape as the next piece. It struck me that this “puzzle objective” (clearing the board) would be much more interesting if the next piece was chosen deterministically, as this would allow planning. b. Use just a single piece type (this was the simplest way to make the next piece choice deterministic – you always get the same piece shape!) Through experimentation I found that the T-piece and the L-piece (or J-piece) seemed the most interesting. The Z-piece was impossible (on a 2D board), and the 2×2 square and the 1×4 “I”-piece seemed rather boring. Using the T and L pieces on boards of width 5, 6, and 7 turned out to be very challenging and interesting. Over time, I was able to develop skills that let me reliably and fairly quickly solve these puzzles. I used a random start position (formed by dropping a specified number of pieces of the given type), and would then proceed to work the pattern down (reducing the number of rows) and finally clear the final bottom rows. I found this both challenging and immensely enjoyable. I particularly like the set of skills I developed that made me an “expert” at these puzzles! These skills formed a natural hierarchy, with higher-level skills building on and using lower-level skills. 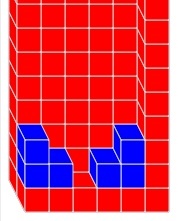 At the lowest levels there are standard Tetris skills (using the controls to rotate and place pieces in desired target locations, and exposing and filling “holes” to reduce the height of the remaining cell pattern). The final “WipeOut” skill (clearing the board exactly) involved learning to recognize specific “solvable patterns” and applying the associated move-sequences (macro moves) to solve them. Some of these macro-moves simply transformed one recognized pattern into another (simpler) pattern that could then be solved by subsequent macros. After I became skilled at these basic puzzles, I started thinking about adding new challenges. I tried a variation using both the T and L pieces (alternating so that the piece sequence was still deterministic so as to allow planning). Having 3 or more pieces can be extremely challenging, even when still deterministic, but experimenting with those possibilities led to a virtually endless set of rich challenges. I even tried returning to the complete set of 7 original Tetris pieces (presented in a deterministic fixed / cylic order) – that was difficult but still a fun challenge, though I still preferred narrower boards — width 10 gets rather tedious and takes a really long time to solve. I found that widths 5, 6, and 7 were most enjoyable. At some point it occurred to me that I could generalize the puzzle objective from WipeOut to achieving a specified Target pattern (a particular set of marked cells to be filled). The WipeOut objective could be viewed as the special case of the “Empty Target pattern”. Initially, I would specify some cells to be left filled in the bottom row. This led to a new level of skill based on doing a “wipeout” in “mid-air”. Let me explain. 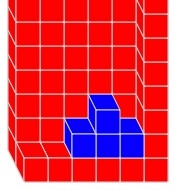 If the target was a single cell in the bottom row, for example, then one could begin by doing a full WipeOut (clearing the board), but this would not “solve” the target puzzle, since the target cell is empty, and needs to be filled. 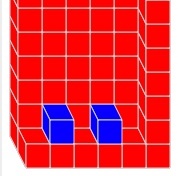 Next, one could place a piece so that it covered the target cell, but no other cells in the bottom row – this might involve “standing the piece on end”, for example. This fills the target cell, but still doesn’t solve the puzzle — the objective is to match the exact target pattern by filling all the marked target cells and no other cells!). In our example, this can be achieved by wiping out rows 2 and above, while being careful never to fill any of the empty cells in the bottom row — I call this a mid-air wipeout. It turns out to require concave pieces (such as the T and L) which can then “hang over the side” of filled cells, so as to fill more and more of the rows to be cleared (wiped out). This introduced an entire new level of skills and patterns! 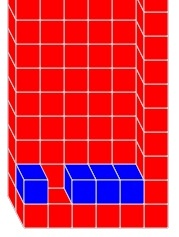 There was an “Aha!” experience I had while playing Tetris on the NES. I asked myself it it might be possible to “suspend a piece in mid-air”, by which I mean have piece “floating” without obvious support (either from below, or cantilevered from a filled cell to its right or left). 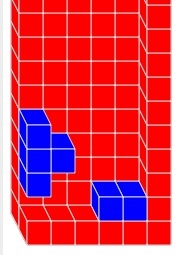 At first blush, it seemed like there was a kind of “gravity” at work in Tetris, so maybe this was impossible. But Tetris-gravity is different — when each row clears, cells above that row only move down 1 cell, in particular, they do not keep falling! So I set myself the challenge of “floating a piece”, and soon discovered that I could create a mid-air platform (2 or 3 nearly filled rows with a piece-shaped hole) cantilevered from a single support cell (that is the row below has 1 cell filled but the rest of that support row is empty). 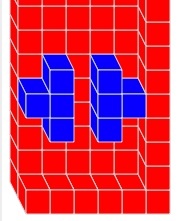 You might notice that the pieces are drawn in a “sort-of” 3D perspective. 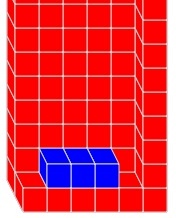 In fact, the current version of Target Tiling supports both 3D board grids and 3D pieces. Check out the game on my web page to try it out: Target Tiling (this gets you a page with instructions on how to download and install – it’s all free!) Eventually I hope to release a version for smartphones, but the current puzzle game runs on MacOSX, Windows, and Linux. To run it, you need to download the LispWorks PE (which is also free) – just follow instructions on my page. If you do try it out, please send me your reactions and thoughts. Thanks! Did I mention that I love music? I love to listen to music, play music, and have tried my hand at composing/songwriting. I love to listen to music. When I’m working on my computer, I love to have iTunes playing in the background. My favorite genre is blues, but I also enjoy classic and progressive rock, as well as newer groups such as ColdPlay and Muse. I have a long list of “favorite blues musicians”, but one that I particularly think deserves to be better known is Sherman Robertson, so I’m giving him a special mention. When I can afford it, I enjoy going to blues clubs, concerts, or outdoor blues festivals. This August I enjoyed both the Gloucester Blues Festival, and the annual Blues & Brews Fest. In June I was able to attend my first Chicago Blues Festival (in Grant Park). The highlight for me was the pre-Festival concert at Buddy Guy’s Legends, where I heard Shemekia Copeland and Kinsey Report (both great!). Also first heard Quinn Sullivan – a young teenage guitar prodigy who is being mentored by Buddy Guy! I also listen to music on the radio – though the ads get to be extremely annoying. I regularly listen to Carter Alan’s Sunday Morning Blues on WZLX FM Boston. My other regular show is Blues Breakers with Tom Marker on WXRT FM Chicago – I listen to this via the Internet. I regularly record both these radio shows using the service of dar.fm, a free service that usually does a decent job of recording radio shows available on the internet (dar.fm also has a paid service that let’s you record more shows and use more storage to keep recordings longer). I listen to Sunday Morning Blues “live” on Sunday mornings (9am-noon) when I wake up in time (which I haven’t done consistently of late). I then listen a 2nd time (or 1st time if I overslept) with the dar.fm recordings after the playlist is posted (usually by Monday or Tuesday). I love to play music, too! I started piano lessons around 1st grade (thanks to my father who was my piano teacher!) Piano / keyboards is still my favorite instrument. I also studied trumpet from 4th to 12th grades, and even tried Jazz Band at MIT, but I never loved trumpet like I do piano — the piano is just so much more versatile! I got my first electronic keyboard as a grad student – an RMI that I played through a Fender Reverb amp. I had fantasies of joining a rock band, and even tried the occasional audition, but never got off the ground with that. I tried to learn guitar, but never felt comfortable with it — too hard for me to memorize all those different chord patterns. I also taught myself recorder, which I found quite enjoyable. I especially enjoy the Renaissance piano/recorder duets I have, and always am pleased when I have someone to play with (I’m to do either the piano or recorder parts!). My favorite classical music for piano are Beethoven sonatas, especially my life-long favorite, the Pathetique! While working at GTE, I enjoyed collaborating with a flute-playing colleague to play the Bolling Suite for Jazz Flute and Piano – a wonderful piece of music. I enjoy piano improvisation, and have also tried my hand at some song writing. I wrote a couple songs back in high school, then some more in college. In the aftermath of my divorce, I channeled my emotions into writing a fair number of songs. I even audited a song-writing seminar at MIT. In that seminar, we had to write a new song each week – at first I thought that would be impossible, but it turned out to be fine. The deadline of “finishing” a song in a week meant that I couldn’t obsess endlessly trying to improve or perfect it. There is a counterintuitive interplay between “quantity” and “quality”. Surprisingly, striving for quantity (lots of songs) can also lead to better quality (compared to tinkering with a single song trying to perfect it). I’m reminded of the writing seminar I participated in at ESG at MIT – we consciously tried to write continuously (stream of consciousness) without censorship. This ended up being very liberating. I also recall reading an anecdote (I forget where) about an art teacher who divided his ceramics class students into two groups: the first to aim for quantity, the second for quality. The surprising outcome was that those students striving for (and being judged by) quantity, also ended up producing higher quality work! My “mini-theory” to explain this is that the quantity group is getting more experience by trying more new and different things, and thus also encounters more learning opportunities. This Spring, I dusted off some of my old songs, and started performing them at Open Mic nights in the area. The Open Mic at Nourish Restaurant in Lexington Center turns out to be very convenient — I only live a block away, and there is already an electronic keyboard there, so I don’t have to schlepp my own! For better or worse (and often worse in my case), the performances there are recorded, so I now have audio available of many of the songs I’ve performed. This Summer, I had the great pleasure of collaborating with my daughter Rachel (who is a violinist – music conservatory major). We performed arrangements of several of my songs, plus a cover of a Bonnie Raitt song. I really enjoyed this collaboration. I was reminded of how much I value collaboration in all aspects of life – not just technical development work. There are even two videos of me and Rachel (kindly recorded and shared by another Nourish open mic participant). Caveat: These are not polished performances, so don’t expect a lot. I hope, nevertheless that you can derive some enjoyment from my sharing them.